I love fuchsia, they’re like tiny ballerinas! A Giant Flowering Variety of FuchsiaBeautifully abundant blossoms and lovely verdant green foliage, these impressive plants are real show stoppers. Much larger than a usual Fuchsia, with double blooms up to 3 in size. Superb trailing from any container or hanging basket and lovely colours too." Create Colourful Tubs and Baskets to Last All Summer!This Trailing Fuchsia collection will provide you with a wealth of tubular flowers in beautiful shades of pink, purple and white. Trailing up to 40cm, this variety will look absolutely stunning cascading over the sides of your hanging baskets, patio pots and window boxes from May until the first frosts. Upright Fuchsias with a Good All Weather ToleranceWith their brightly coloured tubular flowers in shades of white, pink and purple, this collection of Upright Fuchsias will provide you with eye-catching displays from May until the first frosts. This variety is also great in all types of weather, making it ideal for those stereotypical British Summers. Create a Carpet of Colour all Summer long!A great investment and so versatile. This Hardy Fuchsia Collection has been specially chosen for its durability, strong, upright habit and abundance of flowers in pretty shades of pink, crimson, purple and white. These Fuchsias are guaranteed to create a carpet of colour in your Summer displays for years to come. A Super, Prolific Flowering Fuchsia!A super and very attractive, Climbing Fuchsia in striking black, dark purple and deep pink shades. A vigorous hardy variety, ideal for garden borders and patio containers, and really useful for disguising ugly walls and fences. A great choice and a great performer, one of our all-time favourites. Fantastically versatile hardy Fuchsia for Summer colourEach container is complete with plants, compost, FREE Raingel and feed treatment. Care instructions are included.This dwarf bush variety of Fuchsia is perfect for planting in borders, containers, rock gardens or for creating a low hedge, and will flower throughout the Summer. 4 varieties of your Favourite Premium Bedding! You will receive 12 Busy Lizzie New Guinea Star Collection, 12 Petunia Surfinia Classic, 12 Petunia Trillion Bells Carnival Mix and 12 Fuchsia Tailing. That’s enough to fill your containers, hanging baskets with some left over for your fill in borders too. A Brand New Variety for 2017!A brand new variety for 2017, Geranium Pearly Pink features extra large flower heads in beautiful shades of iridescent pink which are complemented perfectly by the backdrop of luscious green foliage. These robust plants are suitable for both drought and dry conditions making them perfect for a sunny spot in your garden borders, beds or containers. Want more? Buy a bigger pack! Bulk buy bedding plants. Perfect if you’re sharing with a garden club or a group of neighbours. Buy a Bundle and Save £55.84To order, simply click buy and purchase at the checkout. Our wholesale manager Lee, will contact you to confirm which varieties you want within your packs.You can order as many packs of 16 trays as you like, made up of any of these varieties. 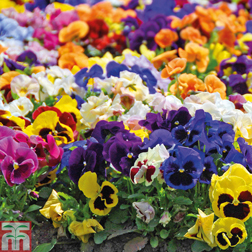 Wholesale Bedding Plants in packs of 16 trays of 170 Plug Plants. Choose 16 trays of any of our selected Plug Plant varieties and you can benefit from our ‘one drop’ delivery service meaning they’ll all arrive together! Plus a massive saving of £55.84! Save £33.84 with these Wholesale Ready Plants!To order, simply click buy and purchase at the checkout. Our wholesale manager Lee, will contact you to confirm which varieties you want within your packs. You can order as many packs of 16 trays as you like, made up of any of these varieties.Choose 16 trays of any of our selected Ready Plant varieties and you can benefit from our ‘one drop’ delivery service meaning they’ll all arrive together! Plus you will receive a massive saving of £33.84! 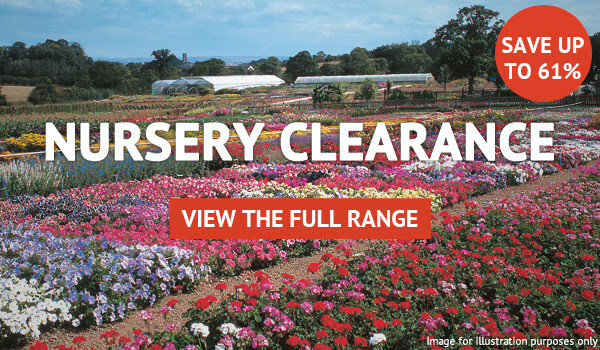 Save even more with our Spring wholesale bedding plants To order, simply click buy and purchase at the checkout. Our wholesale manager Lee, will contact you to confirm which varieties you want within your packs. You can order as many packs of 16 trays as you like, made up of any of these varieties, saving you £31.84.Choose 16 trays of any of our selected Jumbo Plant varieties and you can benefit from our ‘one drop’ delivery service meaning they’ll all arrive together! Plus a massive saving. 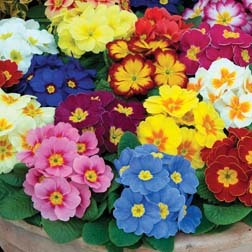 A real rainbow of primroses! There are up to 20 different colours in this specially selected mix. These little gems are extra hardy, so you can enjoy their cheerful display even when skies are grey and temperatures are low. Try them out - you won’t be disappointed! Winter primroses so quick to flower, you’ll get a show this autumn! 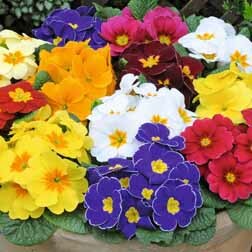 The perfect primrose for long lasting patio containers, baskets and borders. You’ll be overwhelmed by the garden performance of these pompom-flowered primroses. Fresh green foliage hosts tightly packed, huge, rosebud blooms during spring, plus they’re tough enough to stand up to the harshest British winter! They’re worth the investment. 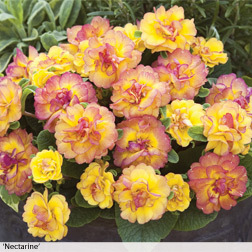 Let the sweet citrus scent and the fresh colour mix of these gorgeous primroses transport you into spring. 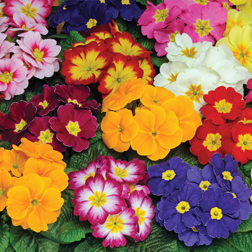 Primrose ‘Worlds Most Scented Mix’ is our best ever selection of fragrant primroses in a range of bright, cheery colours that will look fabulous planted among your spring bulbs. Grow some in a pot by the back door to really enjoy their perfume. Height and spread: 20cm (8"). Brilliant colour, great plants. Lots of choice at T&M. Thompson & Morgan’s award-winning breeders have come up trumps again with this selection of wavy, ruffled, two-tone flowers. Excellent for cool season flowering, so will jazz up winter and spring pots with a carnival of colour and a cloud of perfume, just when we need it most! Suttons say: We’re about to introduce over 1,000 new tree and shrub varieties to our nursery but first we have to clear or repot remaining stocks from last year. These include unusual and highly desirable varieties that can be bursting into leaf and bloom in your garden this spring. These plants are so good and the prices so exceptional that we almost feel guilty about letting them go so cheaply… but we do just need the space. They’re priced to sell quickly but if you’re able to find them available on a website at a lower price (in the same size or larger pots) before placing your order… we’ll match that price! Get great plants at low prices. Jersey Plants Direct just have the most amazing plants – this is a beauty! Great for encouraging wildlifeAttracts Wildlife: This variety is great for attracting bees, butterflies and moths to the garden.Marigolds (or Calendula) have beautiful large full flowers that last well once cut so are great for picking and bringing indoors to brighten up your home. Marigold African Vanilla has less traditional creamy white flowers, which is a fabulous alternative to the usual yellows and oranges of Marigolds. 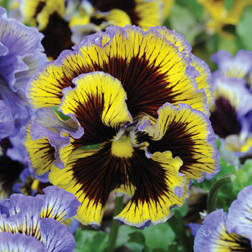 Attractive, delicate, highly scented flowers that are a must in all gardensThese bedding plants are highly scented, dwarf in habit and ideal for patio tubs and hanging baskets. These plants come in bright red and pink colour and will brighten your garden this summer.